PT 30130 & 30131, Off Jalan Johan 2/1A, Estet Perindustrian Pengkalan II, 31550 Pusing, Perak, Malaysia. 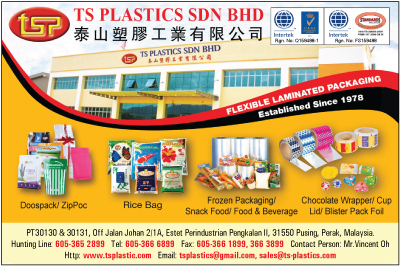 TS Plastic Sdn Bhd is one of the largest plastic packaging & printing companies in Malaysia. On the strength of its professional techniques and excellent management system, it has won the support of its clientele besides winning many corporate management awards. Our production focuses on the high-grade "multi-layer elastic laminated packaging" such as OPP, Polyster, Nylon and Aluminium Foil, Metalized Film, CPP, LLDPE etc. After years of efforts and expansion, we now own a complete range of high effciency production facilities while on the quality aspect, we have achieved the standard of "ISO 9001:2008" and "ISO22000:2005". In 1978, TS Plastics was founded. Although at its initial stage, production of the factory was already mechanized, making PP printed bags which met good response from the market signaling a good beginning. After struggling fro 15 years, in 1993 we further expanded our business and purchased several factory units at Pengkalan Industrial Area in Ipoh. This marked a new milestone for the company. Then 1996 to meet challenges of the market, we elevated our techniques to greated heights. We began to produce "multi-layer plastic laminated packaging bags" of higher grades to meet market demand. On 2004, We were adwarded the International ISO 9001:2000 Quality Management Systems Certification for our consistent product quality. Our good management and accumulated strength enabled us to win the year 2007 prestigious grand award for the enterprise - "Golden Bull Award" in the country. At 2008, we further expanded and set up our factory on a 2.5 acre land at the Pengkalan 2nd Industrial Area operating around the clock and producing more premium quality products to win customer's confidence. Year 2010, we able to up level to ISO 9001:2008 for higher qualifications standard. In 2014, we expected higher level requirements from global markets in multi-layer flexible packaging. TS Plastics has ventured and invest for Solventless facilities to fulfill International markets requirement with additional 30% capacity. On 2015 TS Plastics is having 3rd factory expansion is build on 2 acre land for new warehouse as well as new division's production facilities in large scale that cater for oversea market and MNC business growth. 2016 we had obtained ISO 22000:2005 certification, Golden Eagle Award 2016 and Sin Chew Business Excellence Awards 2016.